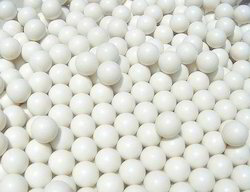 Prominent & Leading Manufacturer from Rajkot, we offer hollow plastic balls, 4" (100mm) hdpe hollow ball, hdpe solid ball, plastic half ball, polyethylene balls and polypropylene balls. We are instrumental in offering our clients a high quality range of Hollow Plastic Balls that helps control heat loss, evaporation, and help with odor and moist control. The offered balls are manufactured with the help of supreme grade plastic and technically advanced machines under the guidance of skilled professionals. Apart from this, offered balls are used as a check-valve ball in flow control applications. We offer these balls in various specifications for our clients to choose from. Hollow Plastic Balls help control heat loss, evaporation, and help with odor and mist control. Hollow Balls are also used as a check-valve ball in flow control applications. Order by the trial pack, carton, bulk pack or truckload. HDPE Balls is a thermoplastic polymer, which produces by the chemical industry and used widely over the years. Very resistant to most acids and alkalies, Polypropylene Balls are useful for vapor and evaporation shields in electrolytic solutions. Because their Specific Gravity is less than water, they are excellent for liquid level float applications. * Price mentioned is for illustrative purpose ; its depend up on size. -Payment Terms: T/T , Western Union, Paypal. -Main Clients: USA, UK, Europe etc. We are an unparalleled name in offering a wide gamut of Polyethylene Balls that are useful for vapor and evaporation shields in electrolytic solutions.The offered balls are manufactured using high quality components and latest techniques in accordance with the international standards. Clients can avail these balls from us in various specifications as per their requirements. We offer these balls to our clients at affordable rates. Keeping track with market development we are highly engaged in offering superior quality PVC Floating Balls. These balls are used in all chrome (electroplating process), hard chrome plating process & anodizing to control the temperature. The offered balls are manufactured using premium quality material and latest technology as per the set industrial norms. They are thoroughly tested on various stages by our skilled quality controllers assuring their flawlessness. Clients can avail these balls from us in various specifications as per their needs. 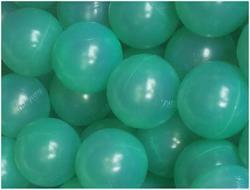 Polypropylene Balls is a thermoplastic polymer, which produces by the chemical industry and used widely over the years. Due to the high current usage during chrome plating, a mist of acid is produced from the tank. This can become a nuisance due to the corrosive nature of the product and its yellow stain. 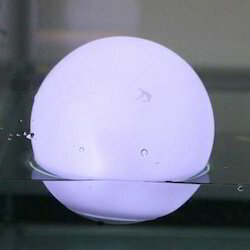 Commercial plating users are using these floating solid elliptical plastic balls to reduce this mist. They are left in the tank and cover the entire surface of the chromic acid solution, reducing the emissions. They will reduce the mist (Fumes) by as much as 80%, saving chemical and keeping the entire operation much cleaner. Mist(Fumes)Control balls are also used while anodizing to reduce acid misting (fumes). Temperature of Media Up to 100 deg.c. Due to the high current usage during chrome plating, a VAPOR (fumes) of acid is produced from the tank. This can become a nuisance due to the corrosive nature of the product and its yellow stain. Commercial plating users are using these floating solid elliptical plastic balls to reduce this mist. They are left in the tank and cover the entire surface of the chromic acid solution, reducing the emissions. They will reduce the VAPOR (Fumes) by as much as 80%, saving chemical and keeping the entire operation much cleaner. 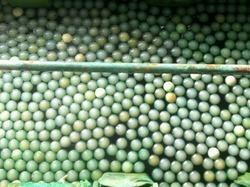 VAPOR (Fumes)Control balls are also used while anodizing to reduce acid misting (fumes). 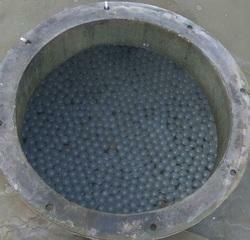 Demister balls are also used while anodizing to reduce acid misting (fumes).